I've always considered myself healthy. As a child I was extremely active and had a pretty well-rounded diet. We ate at the dining table as a family every night. The menu was planned and prepped weeks in advance, and my mom had a Pinterest-worthy grocery system. Meals consisted of a vegetable dish, soup , a viand, rice and of course something sweet to finish. Everything was always fresh and homemade. We would make our own pasta, bread and even grind our own beef. In my teens I became more proactive. I took dance and workout classes, read books on nutrition and had a hand in helping with meal prep. Over the years, I've maintained a pretty healthy lifestyle for my family and I. We all get our daily dose of fruits and veggies through delicious smoothies and salads, I cook and bake at least 3 times a week, and on the weekends I whip up large meals and freeze them for the days I need to serve up something quick and easy. We're all active and engage in basketball, dance classes, long hikes on the weekends, bike rides exploring new cities and pool time in the summer. Recently however, I had a scary health episode that required an intense physical check up. After a few weeks of tests, we learned that I had extremely high triglyceride levels and what I experienced was hypoglycemia. In simple words, I have way too much bad fats in my blood and I tend to experience low-blood sugar from eating the wrong foods. This means I am at risk for developing coronary artery disease and diabetes. While this was a shock, I am extremely thankful they didn't find anything more serious. I'm also thankful that I can make some lifestyle changes now and not later- when it may be much harder to manage my health. It was definitely puzzling, considering my current weight (I am on the lower end of the "healthy range" for my height) and lifestyle. However, I realized that fit doesn't necessarily mean healthy and that genetically our bodies are all very different. There is no one-size-fits-all approach to health. I always watched my portions and hardly over-indulged. After a long hard look at my diet, I realized it made sense. I love my bread, pastas, cake and sweets. Since I now know my body doesn't process these foods that well - some adjustments need to be made. Refined carbs and sugar are the triglyceride culprits. A high protein, low carb/glycemic diet like Atkins is something I have to slowly ease into in order to keep my blood sugar in check, and keep my trigs down. On top of that, I need to avoid caffeine and alcohol (not bad since I pretty much eliminated these from my diet years ago due to my allergies). Fish oil supplements have also been recommended, so I've added these into my vitamin mix (they also have amazing immune system and skin benefits!). Two crucial things I've just recently learned... First, it's so important to get yearly blood tests and physicals - starting in our twenties. Second, it's always a good idea to keep track of nutrition labels and constantly re-evaluate my diet. See, while I thought I was being good and healthy watching fat content and calories, it was the seemingly innocent carb here and there that snuck up on me. There are so many sneaky carbohydrates and sugar in almost everything that I wasn't aware of. For example - milk and yogurt. I now buy a protein packed milk by Lucerne (available at Safeway) with 40% less sugar than regular milk. Other small things like ketchup, ranch dressing, the caramel sauce served with my decaf latte....etc. All. Add. Up. 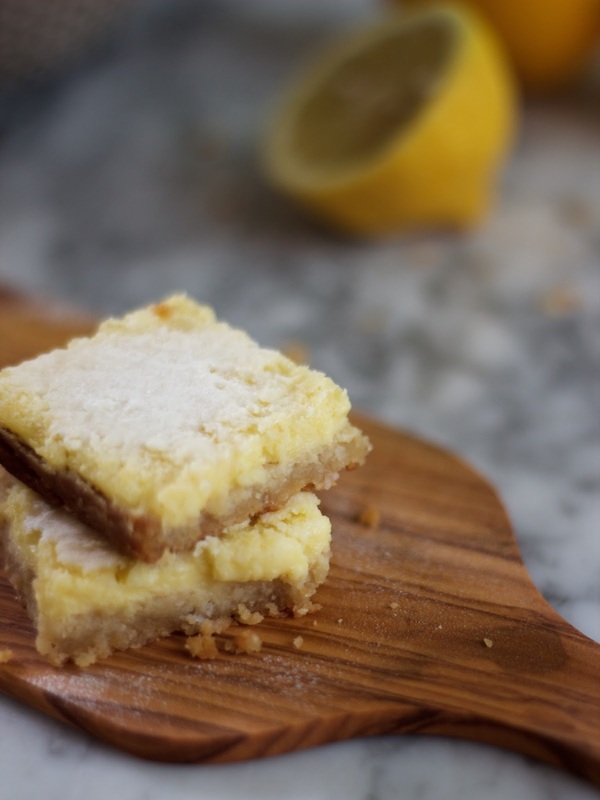 Lemon squares are one of my favorite childhood treats. I just stumbled upon this recipe over the weekend, tweaked it a bit and gave it a go. It's ah-mazing! Typical ingredients are replaced with almond flour, coconut oil, and natural sugar alternatives. Carbs and calories are almost eliminated, and you've got more protein and fiber. Preheat oven to 350 F degrees. Prepare an 8x8 inch square non stick pan. CRUST Combine the almond flour, Swerve sugar , and sea salt in a large bowl. In a medium bowl, stir together coconut oil, butter and vanilla extract. Stir the wet ingredients into the dry until thoroughly combined. Press the dough evenly into the bottom of the prepared pan. Bake for 15 to 17 minutes, until lightly golden. LEMON FILLING While the crust bakes, prepare the topping. 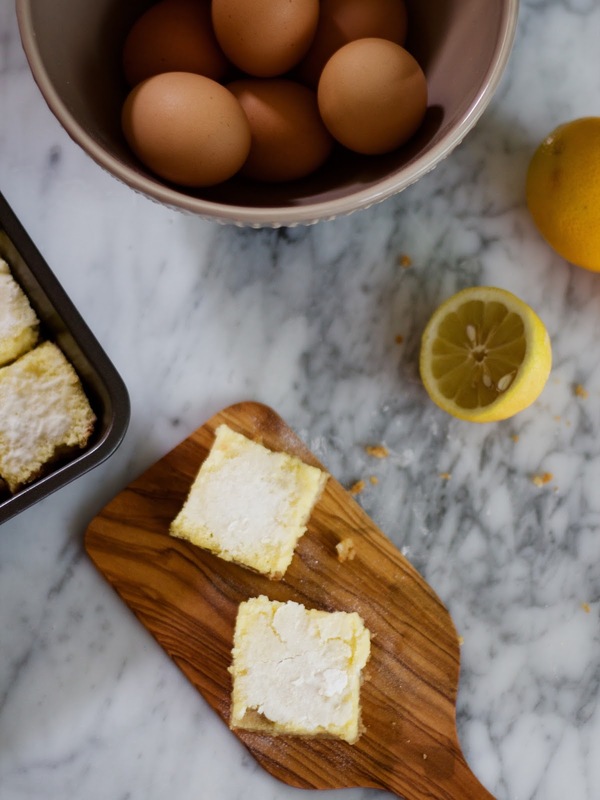 In a blender or food processor, combine the almond flour, Swerve sugar, Xyla , eggs, and lemon juice. Blend until smooth. Remove the crust from the oven. Pour the topping evenly over the hot crust. Pop back into the oven and bake for 15 to 20 minutes at 350 degrees F until the topping is golden at edges. Let cool in the baking dish for 30 minutes, then refrigerate for 2 hours to set. Sprinkle with extra Swerve confectioner's sugar (optional). Cut into bars and serve. Overall I've been feeling great and I'm optimistic my next check up will yield positive results. I don't share much on here when it comes to my personal life, but it feels good to talk about this. I'd love to hear your suggestions, recipes and anything else with regards to managing hypoglycemia, lowering triglycerides and highly effective workouts! You can reach out to me by email, or through commenting below. Thanks so much for dropping by! I hope you give this recipe a go, it's seriously the bomb.